At 132,500 tons and more than 1,000 feet long, Costa's new flagship, the "Regina del Mediterraneo" or Queen of the Mediterranean, was built at Fincantieri's Marghera shipyard at a total investment of US$688 million. Costa Diadema arrived at Genoa at the end of its first or "Vernissage Cruise," which departed Trieste, Italy, Nov. 1. "Costa Diadema is our new flagship, and she will set new standards in the European cruise industry and further strengthen Costa's leadership in Europe," said Costa Crociere S.p.A. CEO Michael Thamm. "She is the best expression of our new brand positioning: Italy's finest -- its passion and modern Italian lifestyle, hospitality and elegance." Costa Diadema's naming ceremony started at 5 p.m. CET today at Ponte dei Mille at Genoa's historic Stazione Marittima. The event began with a parade of the godmother, Italian travel agent Carolina Miceli who was selected in a worldwide contest, and her international maids of honor representing Germany, France, Spain and China. The ship was blessed by Cardinal Angelo Bagnasco, archbishop of Genoa and president of the Italian Episcopal Conference. Onstage in the elegant Emerald Theater the godmother pronounced the traditional "I give you the name Costa Diadema" and, assisted by Captain Massimo Garbarino, cut the ribbon to break a 3-liter jeroboam of Ferrari Gran Cuvée Trentodoc spumante on the bow of the new flagship. Following a light show and fireworks that illuminated the skies over Genoa, celebrations continue onboard with a gala dinner featuring a special menu created by Costa's Michelin-star chef Fabio Cucchelli. Evening entertainment includes the new shipboard production show "Sapori d'Italia" ("Flavors of Italy"), talented international artists 18-year-old baritone Simone Baldazzi, the acrobatic duo Celia & Julien and the Phly Boyz performing songs from the 1920s to today. The masked party "La Notte in Maschera" caps the nighttime entertainment. Costa Diadema departs Genoa tonight, arriving at Savona, Italy, on Saturday, Nov. 8, for the inauguration of the second terminal at the Palacrociere, Savona Cruise Terminal, managed by Costa Cruises. 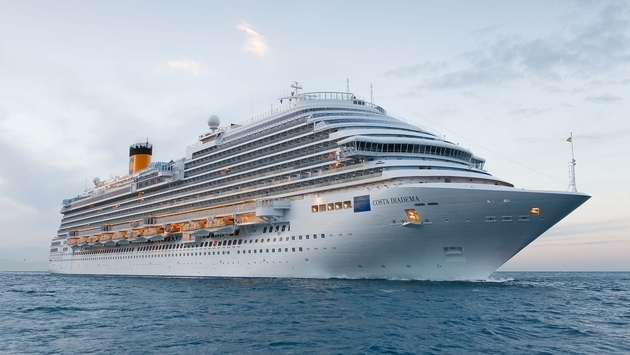 From Nov. 8 until the end of 2015 summer Mediterranean season, Costa Diadema will depart Savona on seven-night cruises calling at Marseille, France; Barcelona and Palma de Mallorca, Spain; and Naples and La Spezia, Italy.